About the time when Spring Break arrives I hit the line in the HIST 152 syllabus calling students to consider the 18th-century Enlightenment and its offspring. Of course this leads to political liberalism and the notion that we should trade kings and queens for politicians who won their place through innate ability rather than inheritance. The will of the people shall choose the rulers, not DNA. In the salons where these ideas were hatched it was assumed this would go smoothly, once the historical detritus had been swept away by waves of reform and optimism. And we’d all live happily ever after. Every semester when I teach this topic I can’t help but take a mental inventory of how far the mirror of reality has dusted over the periwigged musings of the 18th-century philosophers and their muzzle loader toting revolutionary followers. 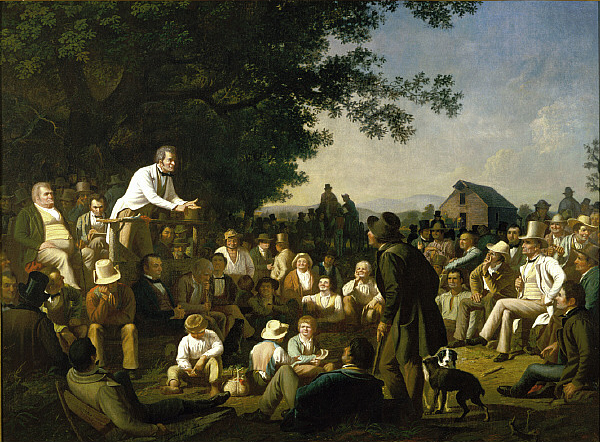 During the 1850s the American painter George Caleb Bingham immortalized a Missouri canvass’s exuberant messiness on three canvasses: “Stump Speaking,” “The County Election,” and “The Verdict of the People.” From a politician in a white cutaway appealing to the sleeping, bemused, befuddled, and distracted, Bingham moved to the voting of the drunken, comatose, and bribed, and on to the revels in the aftermath of the announced results. It’s Voltaire and Montesquieu meeting the Age of Jackson on the American frontier and leaving with punctured illusions. Would Jeb and George W. be known nationally if they were Bosch instead of Bush? If Hillary had remained Rodham without the Clinton, would she be the favorite? Would Jeb or George or Hillary be worthy and welcomed for an afternoon of witty conversation with Madame de Stael and her fellow salonnieres? How long would a candidate with a headful of focus-group tested one liners last in such a space? Or how about Ted or Rand matching bon mots with Benjamin Franklin? Instead of the salon and its badinage, Ted and Rand and Hillary and Jeb and Chris and Marco and Scott and host of others will repair to an Iowa coffee shop or Pizza Ranch to engage in chitchat over sinkers and fried chicken (it beats the pizza, trust me). In scenes echoing Bingham’s election canvasses the would be high and mighty will confront the ordinary folk, the earnest ones Bingham generally consigned to the side but clearly within the frame. And maybe, just maybe, every once in a while, the white suited façade will fall long enough to reveal the human being behind the boiler plate. The candidates’ handlers will strive to keep Bingham’s drunks and comatose from intruding. Who would want Mayberry to stumble into Utopia with Otis Campbell boozily draping his happy arm around the shoulder of a would-be president? Bingham would approve. Madame de Stael might not, unless Otis had written a worthy pamphlet. Even a Rousseau could be tolerated in upper crust Paris, if not in Cedar Rapids. And so we are in for another year and a half of the perennial confrontation between the dreams of the past and the realities of the present. We will see what will happen when the salon’s habitues retreat to the unkempt streets, when refinement confronts the world of Bingham, or James Hogarth. And from it all, inexplicably, something will result, a new leader. Maybe there was something to monarchy after all. A potential for tidiness, if nothing else. Except even monarchs ain’t what they used to be in tabloids and twitter feeds. It’s enough to make one seriously consider the viability of Voltaire’s conclusion, that we should simply tend our garden and eat citrons and pistachios. Except the noise of Bingham’s world would scale the fence. Robert Schoone-Jongen is in his eleventh year at Calvin College, working with student teachers who hope to become high school and middle school social studies teachers. His historical interests are immigration, American social history, and the presidency. 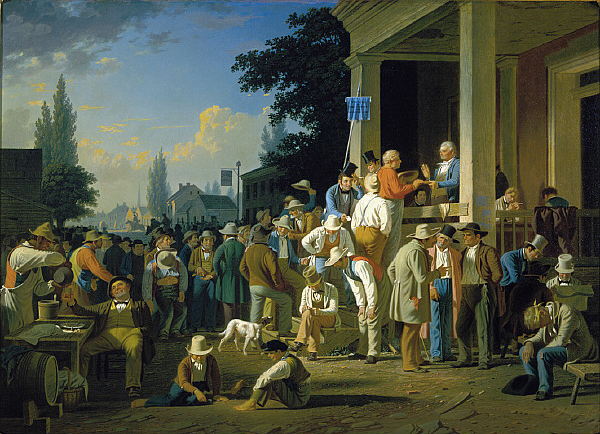 This entry was posted in Bob Schoone-Jongen and tagged election, George Caleb Bingham, history, politics, US history, US presidential election. Bookmark the permalink.